Low prices. OrangeSmile.com offers car hire service in Mauritius on the lowest-rate-guarantee basis, since we work with car suppliers directly. For your search criteria in Mauritius, we always select and show the best rental offers. The car reservation process consists of 3 simple steps: (1) search for available cars for your dates in Mauritius; (2) select your car type; and (3) fill in the booking forms. Once the reservation is completed, you will receive a confirmation voucher to your email address. During the booking process, please check your rental conditions. To pick up your car at the rental point in Mauritius, you need to provide our confirmation voucher, your driving license and a valid credit card. The final payment is normally carried out at the pick-up point. Our car hire points in Mauritius accept VISA, MasterCard, etc - please check your rental conditions. At the pick-up point, please read the handling manual and check the car for present defects. 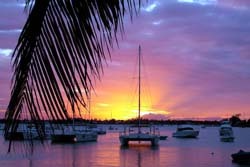 OrangeSmile.com wishes you a pleasant journey to Mauritius! The car hire reservation system OrangeSmile.com allows renting a vehicle in Mauritius within 10 minutes. Our largest database of car suppliers enables us to provide you a rental car in Mauritius at the cheapest rate ever possible. At rental locations in Mauritius we offer the following car sizes: mini, compact, economy, standard, premium and luxury. The following car types are available in Mauritius: Sedan, Hatchback, Jeep, Cabriolet, Coupe, Minivan and Minibus. Besides beautiful nature, the island of Mauritius attracts guests with its fascinating architectural landmarks and great choice of entertainment to fit any taste. Several important landmarks are located in the capital of the island, the city of Port Louis. There is a beautiful building of Government House, and one of local medieval houses has been turned into the Museum of Natural History. Racing has become a very popular entertainment on weekends. The event traditionally takes place on Champ de Mars. The suburbs of the capital are the location of a popular place – Domaine Les Pailles, where visitors will enjoy many interesting excursions. Tourists are offered to make a ride on jeeps in the piedmont region, explore local nature in a miniature train and have a dinner in one of cosy local restaurants with spacious terraces. The local botanic garden is also worth visiting as many trees that grow there are several centuries old. You will also find huge water lilies and other exotic plants in the garden. Among the main architecture landmarks of the area it’s simply impossible to fail to mention Eureka Colonial House & Port, which is surrounded by a beautiful park. Don’t forget to visit Mahebourg as there are buildings that date back to the 16th century in this small town. Moreover, there are several large nature parks near the town, the biggest ones being Domaine du Shasseur and Grand Bassin. During an excursion in these parks one will see many interesting animals – wild boars, deer, monkeys and more than a hundred species of birds. The village of Chamarel has become a true diamond for geologists as the soil near the village is coloured in the most unusual colours. Tourists will also enjoy Rochester Waterfalls and Gris Gris Beach. When visits to numerous parks and nature reserves become a bit boring, diversify your travel by exploring Curepipe as nearly every street in this town is an important historic object. The must see destinations include the Royal College, the Municipality building, Town Hall and the local public library. The library keeps some precious manuscripts dedicated to the history and development of the Mascarene Islands. In suburbs of the town one will see beautiful villas that were also built during the colonial period. Fans of shopping will be pleased to spend a day in Rose Hill as in this town they will find numerous shopping centres, markets, boutiques and the biggest food bazaar of the region – Arab Town. As a rule, a border-crossing permission fee is not included in the rental rate. It is paid additionally in the office in Mauritius. Normally, the fee is approximately 2-10 euro/dollars a day. Prior to arriving to the Mauritius office, make sure that you possess our confirmation voucher in a printed form. Rental offices in Mauritius are not obliged to accept electronic vouchers.